“Hi folks – seems like you’re making a great product and actively looking to keep it great. I learned of the Rido saddle from a friend in India (it’s probably the only one in that country!) who is an ultra-long-distance cyclist. He recently took part in the Race Across America, but was unfortunately knocked out by pneumonia four days in. When he first got it and I asked how he liked it, he responded “I don’t even know that it’s there”. On the third day he switched to a regular saddle hoping to alleviate the inevitable saddle sores from such an effort, and almost instantly switched back! “I received my new Rido R2 saddle late last week, and took it out for a test ride over the weekend. To my surprise, I was able to go over 50 miles with absolutely no discomfort. And that is the the most remarkable part about this product – I didn’t have to think about it. The R2 just functioned as it was designed to do and let me focus on riding. “Just thought I would drop you a line to say thanks for making a decent saddle! 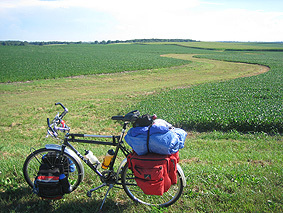 I am just approaching the “three score” age and have recently taken up cycling again after about 30 years – I was beginning to have second thoughts due to “NNS” and all the other symptoms after even just a few miles on the three different saddles I have tried on my hybrid. I decided to have one last go at finding a comfortable saddle and having done more “research” on the web it was a choice between a certain “U.K. nose-less suspended saddle” and the R2. I actually tried to order the “other” one but received such an off-hand and disinterested response on the telephone I decided not to proceed. I then noticed that SJS Cycles actually distribute your products (they are only a few miles from me) so that was it – popped in to SJS and got an R2 yesterday. Having fitted it to the bike I gave it a brief try – Oh dear – I think I have made a mistake – seems rather hard and I was slipping forward! Today I checked your website for some suggestions – I have put the nose up slightly, moved the seat forward on the rails (so I can get the sit-bones right to the back of the pads when necessary) and gone for a 15 mile ride (road and trail). 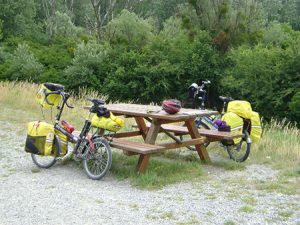 I did not get a “eureka” moment BUT I noticed at several stopping points (looking at the view or wildlife on the Somerset levels) that I did not experience the creeping numbness experienced with all the other saddles I have used. I also noticed my average speed had improved significantly? Obviously it takes a while to realise the benefits – the main one being that it is so easy to adjust your position to a slightly different support area when needed, aided by the slight flex in the whole saddle. As I sit here typing this email I am “aware” of the fact that I have been sitting on a different part of my anatomy – my sit-bones – but they are not sore or tender – and I assume they will acclimatise with more use! Importantly I note my legs feel less exerted and the “gentleman’s area” is conspicuous only by its lack of any grumblings whatsoever – brilliant! “Helt underbar. Stenhård men utan att skada familjejuvelerna. Hade den 5600km i somras. “I became aware of the Rido saddle through a cycling acquaintance. He had some prostrate issues and thought that it might help with a tail bone issue that my wife had when we purchased a tandem. My wife had a tail bone injury many years ago and we’ve constantly looked for a saddle that would at least minimize the pressure put on the tail bone area. So in June of 2010 we purchased one of the Rido 2 saddles. Both my wife and I tried it and to be honest could not get use to the shape. We shelved it for a month or two and tried other saddles. No other ones that we used helped so we went back the the Rido 2 and spent a lot of time adjusting and experimenting with saddle position. After much trial and error my wife gave it the green light as the best saddle to use for her particular tail bone problem. Unfortunately for me I had a tailbone injury in January of this year and went through the same adjusting and experimenting with saddle position and tilt angle and have come to the same conclusion as my wife. For tailbone issues the Rido 2 saddle is the best of the many that we have bought or borrowed. 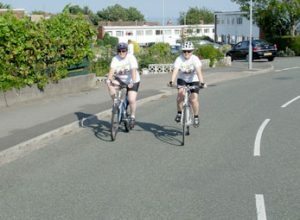 “As for riding type, my wife is relitively new to cycling. She has been doing long tours with me for the last 4 years. So our riding is based on touring and day trips for exercise. I’ve been riding for 40 years and in that time I’ve done at least a small multi-day tour every year. Again I’m a tourist and club rider with some errands thrown in as well. My wife’s distance cycled this year will be about 2,000 km with our longest trip a tour of the Danube which was just over 1,600 km. My distance stands at 4,700 km which included the 1,600 km Danube trip and a trip of the southern US which was just under 700 km. My wife has a Bike Friday “Crusoe”. I have a Bike Friday “Crusoe”, a Devinci “Caribou”, and a single speed city bike and we both share a Bike Friday “XL Tandem”. Currently all but one of these bikes is equiped with the Rido 2 saddle. “I would just like to say I am more than pleased with my purchase. I purchased one of your saddles in the hope that yet this was the one!….. and I can honestly say it is! “I was reduced to riding, maintaining, carrying a plastic bags for the rain using a LEATHER Brooks seat for years. Absolutely gave up trying anything else. Until I bought a folding bicycle in Singapore and the shop had these RIDO saddles) in stock. “I’ve ridden this one a lot also but for the last year it’s on the folding bike hanging on the porch with a bag over it and I’m riding the old model. Don’t ask me why? They are both the best I’ve ever sat on. But you know me. I’m such a sucker for SIMPLICITY!!! The 1st one I bought is finally showing signs of failure after many years of daily use. Absolutely no complaints. I’m still using it. Being an ex-manufacture of boats I would want to see how my products eventually failed no matter how badly they were abused. As in way beyond any reasonable expectation of level / life of service. Being 125 Kilos I am amazed the seat lasted as long as it did. Also, while I do try and keep the saddle out of the sun. This is Phnom Penh, Cambodia. Heat and UV are tough on plastics. “Very pleased with our saddles – but how do you pronounce the name? As in read, eye, or rid ? “Actually still no contact with the perineum – this while hammering along with hands on the drops. The photo is misleading. The pads – firm but surprisingly shock absorbent – set you up quite a way above the nose whose only use is as a “guide” for the thighs. I have the nose tilted up a fair way too to avoiding sliding forward. Interestingly, I noticed afterwards on the website that they say that for time trialling the best position is to tilt the nose up. I had terrible problems with saddles before trying the R2. Two years on and I have never missed a ride due to saddle soreness of any kind. I consider it on a par with Campagnolo Record hubs. There really isn’t anything better to put on a bike. Fit and forget. Yes, it’s 200 grams more than most racing saddles but this pales into insignificance besides the extra (and hugely more comfortable) time I can put in on the bike. Result – a huge improvement in my riding ability. “Interestingly other club members have taken different routes to save the perineum. Two on Selle SMP’s another on an Adamo – and these are damn good riders. Looking at the designs I don’t think either has as good shock absorbing qualities for the sit bones as the Rido R2; but this is purely my opinion. They’re also about five times the price! “Mission accomplished, Markesan, Wisconsin to Bar Harbor, Maine, 29 days, 1776 miles. A ride that defies description, but will say: varied, beautiful, tough, challenging, incredible, hilly, hot, perfect weather most of time etc.etc. Happy with the RIDO saddle, certainly made ride less painful, and no bladder infection after ride like I had experienced on some previous stages. 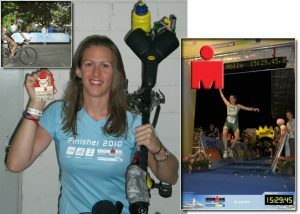 Did 4 stages in the last 4 years to sucessfully complete my quest to ‘Ride Across America’. I use the RIDO on my road bike and mountain bike also. 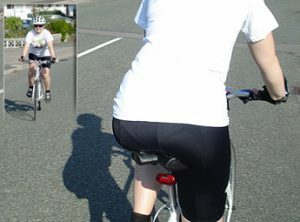 I like the way you can vary your position on the saddle, forward and backward to keep the blood flowing in that area. Completely satisfied with this saddle. “I have used both earlier models and loved them. I have done at least 35,000km on them with no discomfort or saddle sores whatsoever. “I have been using the RIDO saddle for about 8 months now. I am very satisfied with it. I bike for leisure, once or twice a week. It is the only saddle I have found comfortable enough to use on a regular basis.